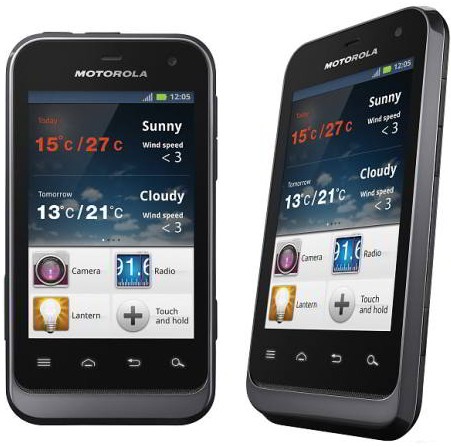 Alongside the launch of the Motorola MOTOLUXE, Google?s newly acquired Motorola Mobility also announced they will be releasing the Motorola Defy Mini in February 2012. The name it has been given is a great indicator of what?s to come. The mini bit is obvious – it?s small. Tiny in fact, with a 3.2inch HVGA touchscreen covering the front of the phone. The other part is ?defy? – a testimony to the strength and durability of the little device, least of all because it?s both dust-proof and water resistant, making it the perfect phone for the younger generation. The term water-resistant doesn?t really do it justice however, as waterPROOF is a much more accurate statement in that it is actually able to remain fully functioning even when submerged in at least a metre of water for as much as half an hour. Whilst there has been several phones to provide a similar level of durability in the past, the original Defy from Motorola is generally seen as being the first smartphone to offer this tough, waterproof casing with the features that any modern phone couldn?t really do without. The Defy Mini is essentially just a smaller version of it?s predecessors, with a 3.2inch screen as opposed to the previous 3.7inch screen – not a huge difference on paper, but certainly noticeable when it?s in your hand. This screen is layered with Gorilla Glass to further cement it?s durability, ensuring that the glass is scratch-resistant. The camera is far from industry-leading at just 3mp but with a more basic phone like this, the target demographic are unlikely to use it for taking photos. It does however have a LED flash so in the event that they do require it, the camera is able to take clear pictures. In addition to the rear camera, it also has a VGA camera on the front to allow the users to engage in video calling should they so desire. The battery within it is 1650mAh which means it is capable of up to 10hours of talking before it needs to be recharged or if it is unused and simply kept on standby, it can last as much as 3 weeks. That?s pretty impressive stats for a battery able to squeeze inside a phone measuring just 109mm x 58.5mm x 12.55mm. All in all the phone is a great little gadget, not for the most high-tech gadget lovers but perfect for both the younger generation who want to be able to access their Facebook, send texts and video chat but who are prone to damaging their expensive device., but also the older generation who may wish for a more simple smartphone whilst still having access to their emails and being able to easily access their phonebook. With better network signal around the world, more and more people are looking for a smartphone capable of keeping up with both their technological requirements and the increasingly challenging environment. This was a guest post by Simon from Best Mobile Contracts, the UK’s leading mobile phone comparison website. @beatriz and @nicole thanks for the comments. I’m so glad I moved from my iPhone to my droid bionic. its like going from elementary to college. I just thought I would let you know I just got hold of one of these from a friend as he is now upgrading. I was pleasantly surprised at how good it was for an entry level phone. Even though a year old.